Why is paintball totally awesome? We use the finest rental paintball gear on the market. CAPE TOWN PAINTBALL is committed to ensuring that your special paintball event is a quality top notch experience, and we believe that this starts by kitting paintball players out with top notch paintball guns and protective paintball masks. GI Sportz – previously known as Tippmann – has built a reputation for itself as the leading manufacturer of paintball markers and other paintball gear on the market today, and has been in the business since 1986. It is for this reason that we use the tried and tested Tippmann FT-12 for all our paintball games. Tippmann paintball guns never disappoint! For ultimate protection and comfort, all players are required to wear JT Premise Goggle System thermal paintball masks when on the hot zones and during skirmishes (more information to follow). Paintball in South Africa continues to grow and is becoming more and more popular. Our partner company, Durban Paintball, has run a successful paintball business for twenty-five years. This is where our team learned the ropes of both the sport of paintball games and managing corporate and team build events for small and larger groups. We initially branched out with a laser tag operation – S.W.A.T. Laser Tag – in 2010 in Cape Town, Durban and Gauteng. Over the years and due to increasing demand from our clients we have realised the need for a high-end venue for paintball in Cape Town, since so many people were asking, are there places to play paintball near me? You can be rest assured that our extensive experience means that we don’t mess around but provide you with the very best rental paintball guns, paintball gear, professional expertise and assistance to ensure an awesome paintball event. When not in use, all of our paintball guns (also known as paintball markers and incorrectly referred to as paintball pistols) are at all times covered with paintball barrel socks or have barrel plugs inserted so as to avoid any unnecessary accidents. Furthermore, we have an age restriction of 12 for both boys and girls. (11 turning 12 is fine). This is due in equal parts to the pain factor of paintball, as well as the various rules and regulations of the game that must be strictly adhered to in order to ensure both player and spectator safety. Once they are old enough, paintball games is one of the best team building and birthday party activities for kids. GI Sportz is an American company that manufactures a wide array of paintball, airsoft and laser tag gear. Their paintball guns are so highly regarded that special models and ranges are even produced for the U.S. military for training purposes. The company is also a regular sponsor of major paintball teams and tournaments across the globe. The Tippman FT-12 is a semi-automatic .68 calibre paintball marker that is popular with many action packed paintball venues as a rental marker due to its reliability and the ease with which it is able to be repaired on site. It is designed so as to be easily disassembled for emergency maintenance. In other words, you can rest assured that your paintball marker won’t bail on you in the heat of the game. Our experienced paintball marshals will be on site at all times in the event that something goes wrong with your paintball marker and will take care of the issue in practically no time at all. We are committed to using only the best paintball guns and paintball masks, as we understand that the best paintball gear is crucial in order for everyone to optimally enjoy an action packed session of various paintball games. The Tippman Ft-12 is compact and has a comfortable front grip, which means that it is an easy to operate and highly enjoyable paintball gun for both beginners and experienced players alike. One thing we can tell you is that cheap paintball guns and gear aren’t worth it! We have only the best rental paintball guns for hire. Safety is our first priority – right before adrenaline and fun – and this is why we supply players with the very best paintball masks on the market. The JT Premise Goggle System is the result of over thirty years of design experience by JT Paintball, all condensed into one high-end mask that allows a 260 degree field of vision. Features include a Pro-Change Lens and Foam Quick Release System to both fit snugly onto the face and allow for quick removal. 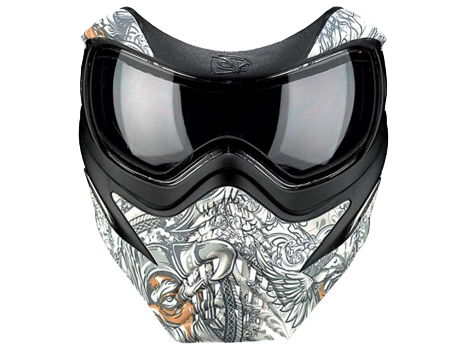 The JT Premise Goggle incorporates the JT Spectra Lense, one of the most popular choices of paintball lens due to its paintball mask anti-fog properties. Other features include an adjustable head strap with silicone strips for a comfortable fit, an adjustable chin strap and built-in visor. If we do say so ourselves, it is a pretty cool paintball mask. To avoid any confusion, please note that we do not have paintball guns and equipment for sale and do not run a paintball store! Unless we are running a very large paintball event, we typically divide the players into two teams and play various game scenarios. Players are then briefed on rules and how the game is conducted, and then given an instruction on how too safely and effectively us their paintball guns/markers. We then kick off with an introductory ‘easy’ level game before moving on to a more complicated and interesting scenario. Each player is issued with a vest to determine which team they are on (players can even choose paintball team names! ), and a qualified field marshal is on site at all times to ensure that players adhere to the rules. How long does the paintball event last? Our paintball packages usually last two hours, but we are able and willing to make prior arrangements to suit the time needs of your group. Length of the event is also heavily dependent on your budget and how many paintballs you can afford on the day. We will always have ‘value for money’ in mind so chat with us and we will go the extra mile to work within your budget for the big day. For anyone who is after the rush that simulated combat provides, paintball is a no-brainer. It is as much about the fun of marking (shooting) rival players as it is a game that requires strategy,communication, shrewdness and stealth. Action paintball games provides a rush unlike anything you’ve ever experienced! If you are looking for an activity that will allow your colleagues, associates, friends or children to have the time of their lives while challenging each other in a (mostly) civilized environment, you’ve found it. Team building paintball is one of the coolest games for kids birthday parties and one of the most fun team building activities you’ll ever get to experience. Paintball is known for its pain factor (good paintball guns aren’t weak! ), and this is why our marshals adamantly police the five-meter-rule. Contrary to what you may have heard, though, getting marked by a paintball gun isn’t nearly as excruciatingly painful as it is made out to be, provided players keep a reasonable shooting distance between one another. Getting hit is nothing more than a slight sting (you’ll be pumped with adrenaline at the time) and the bumps and bruises will fade within one to two weeks. It’s great fun shooting someone with a paintball gun, just be prepared to take it on the chin when you get your chance to get shot! Our staff all have first aid certification along with many years combined experience running and hosting outdoor based events. They are able to handle pretty much any situation that may arise on the day of the big bash!